First, we've got anomalous red rainstorms of seawater and human body fluids. Next, we've got an anomalous submarine that emerges from ponds, puddles, any sufficiently broad surface of water during these storms. Third, there's the entities in diving suits who emerge from this submarine, collect humans either by persuasion or by force, and put them in diving suits of their own, insisting that it's the only way for anybody to be "saved." To be extra confusing, some of these entities bark like dogs, meow like cats or gurgle like babies. All very, very freaky so far, and could have easily ended there if it were an older SCP, but then we get a couple of interview logs and the real weird begins. From the perspective of someone "rescued" by the sub, we learn that there are thousands upon thousands of these suited entities lined up in its seemingly infinite interior, and that you don't have to eat, drink or sleep once you've got one of the suits on. We also learn that between the "rescue missions" back to our world, the submarine returns to what is either a future or alternate version of our reality in which everything is water. Rocks, trees, buildings, animals, air, outer space...all just water, in different colors and densities, floating permanently where it used to be like a liquid mirage. Things take a turn for the extra surreal when we're told that every human and animal adrift in this water-world is missing their eyeballs, teeth and jaws, as if something came by and took a big bite out of their mouth before plucking out their peepers. The submarine's raving captain offers only scant explanation of anything, saying that the "taker of eyes and biter of teeth" is responsible, and that the rainstorms represent a "horrible" other world "leaking" into our own. 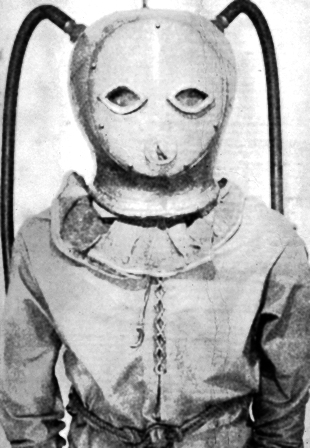 In the SCP's final twist, the interviewed victim finally removed their diving suit and promptly "dies," as nothing was inside the suit other than water. Water, and a set of eyes and teeth that didn't belong to the original person. WOWZERS. The progression here is pretty stellar. The first set of questions - who these beings are, where the submarine comes from, what the rainstorm has to do with it - are all answered with only deeper, weirder questions, and just when it seems like one big discovery is going to tie them all together, that last shock leaves the whole thing tormentingly wide open to speculation...but even without explanation, the elements here all manage to feel very cohesive. The water world, the water beings, the body fluid storms and those damn eyes and teeth all form a clearly interconnected web, but missing some single, big central piece beyond our grasp. This is how you do "the unexplained." Not just a sequence of pure nonsense elements, but elements with just enough in common for us to know there should be sense to make out of it. Perhaps the most intriguing question, however, is whether these beings are truly "rescuing" people from an anomaly, or mistakenly have it backwards, abducting people from a world in no danger it at all to imprison them in one that was already destroyed.